Best Views On Cape Cod. Luxury 4 b/b. Waterfront! With perhaps the finest ocean views on all of Cape Cod, this beautiful rental property offers the perfect combination of luxury, relaxation, and family fun. This 4 bedroom, 4 bath home sits high on an East Orleans bluff, overlooking a saltwater, sun-kissed, inshore swimming bay(with dock!). With easy access to Nauset beach and the ocean beyond, your family and friends can spend the days collecting shellfish, catching stripers, kayaking, swimming, or simply taking in the expansive views. While your group begins their afternoon kayak trek back from the easily accessible National Seashore and Nauset Beach, you can prepare the day's catch in the expansive chef's kitchen. As evening encroaches, prepare a "Cape Codder", and relax on one of the many oversized decks overlooking the bay, sharing your newly created, life long even catching a glimpse of whales in the distance or a seal cruising the shoreline. This salt waterfront home is located in the exclusive Ocean Harbor Association in East Orleans. The large family friendly home is set on 2 acres of beautiful multi-level grounds with frontage and views of Mill Pond and Nauset Beach beyond. Total of four spacious bedrooms - 3 with ensuite bathrooms. 2 bedrooms on second floor w/King & 2 Doubles + crib(upstairs). Billiards table and dart board on lower level family room. Fireplaces in main and lower living areas. Walk outs from lower level family room and main level kitchen/family room to large decks. Balconies off of 2nd floor bedrooms. 4 decks in all! Hello! My name is Michele and I grew up just just North of Boston. My husband and I, along with our daughter, enjoy spending time on Cape Cod and currently live in Boston. My husband grew up on Cape Cod and wanted to keep a connection to the area. We began looking for a second home and fell in love with 30 Harbor View the minute we walked through the front door. The views are so calming and wonderful. Sitting out on the deck, birds fly by at eye level and its just a very special place. Even in winter months, the views are great. Downtown Orleans is so quaint with so many cute shops and great restaurants. There are also great neighboring towns just 15-20 mins away. When we walked into the open house when we first found the home, the realtor said "you can see whales from here". My husband and I thought for sure it was a sales pitch. Knowing my husband was a fisherman, she also talked about the great striped bass caught right in the pond below. Again .... another sales pitch. Once we closed on the property in late May, we sat on the deck and saw the water spouts in the ocean directly out and it was like it was on cue - we could see whales' tails splashing out of the water. We both grabbed our binoculars and I think I spent the greater part of that day just watching them (and to this day each summer I am still as excited as that first time). My husband has also caught many striped bass in our pond to this day. 3 of the bedrooms have ensuite master bathrooms. The bedroom on the 2nd floor has a bathtub. The lower-level bedroom has a bathroom just outside of the room, but not attached to it. Main level has a powder room off of the kitchen. Salt water pond in backyard with swimming dock. Open floor plan with dining area in kitchen and also outdoor dining. patio dining table as well as comfortable lounging area. Association Tennis courts available. We can supply rackets and balls. Hitting Net on Property. There are several great courses just 6 miles in the abutting towns. Please inquire and I can provide information. We had a wonderful time. What a beautiful home, and the breathtaking view of the saltwater ponds and ocean far exceeded our expectations. 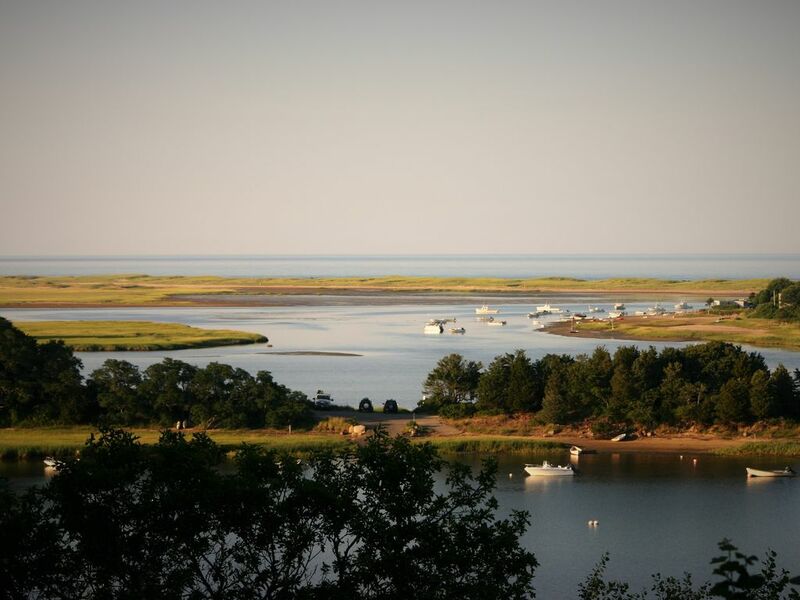 We have rented on the Cape, and within Orleans and Wellfleet, for many years. This home is truly a gem. We did not want to leave. Thank you very much for sharing your beautiful home.